Never let the ups and downs along the way, stop you from doing what you know is meant for you to do. Never give up even if you have nowhere else to go, because at the end of the day life must go on. Just be patient enough to handle your situation for you to be strong. Don't be afraid to walk into greatness, the last shall be first and the first shall be last. So keep the faith and move forward, God sees you, even when you don't see Him working in your life. You can either throw in the towel or use it to wipe the sweat off your face and keep moving forward! Sometimes life seems a dark tunnel with no light at the end, but if you just keep moving forward, you will end up in a better place. No matter how hard it seems just keep going, don't quit because we only fail when we give up. 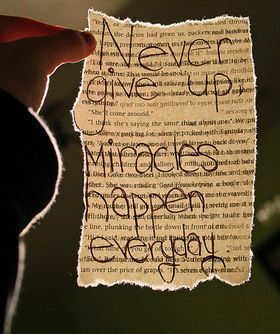 To never give up can be defined as one’s ability to not at any time, even in times of supreme difficulty, to stop going. An attitude that enables someone to never give up is an attitude that we should all seek to have. To never give up means to look failure in the eye and tell it that you are coming for a rematch and that you will not settle until you win. To never give up is to be smart, to gain as much knowledge as possible about yourself, and about life, and to be confident enough to use this wisdom in order to achieve the things in your heart in which you are passionate about. To never give up sometimes means that a man’s ego and pride must be put aside in order to keep moving forward. To never give up is a hard thing to do, it is very easy to say, but in order to be able to put this in action, one must be willing to risk losing everything.